This exciting 5 spoke forged racing wheels set, has been exclusively developed by TYGA Performance and PVM to bring you the ultimate wheel combination for your motorcycle. 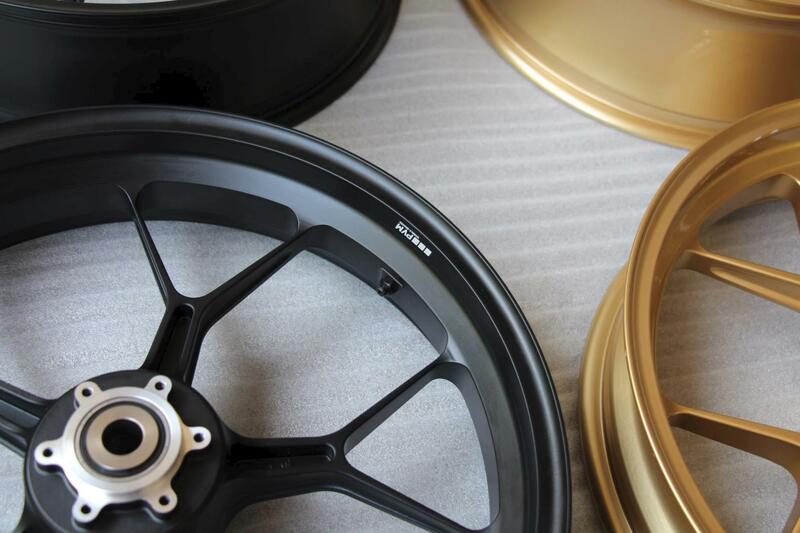 PVM is a long established German wheel manufacturer, supplying motorcycle manufacturers such as BMW and racing teams in Moto GP such as Tech3 as well other series around the World. For this project, TYGA Performance reached out to PVM to supply a wheel specific to the requirements of the motorcycles we ride and love. The result are these beautiful and functional wheels you see on these pages. Far greater corrosion resistance compared to magnesium wheels, without increased mass. 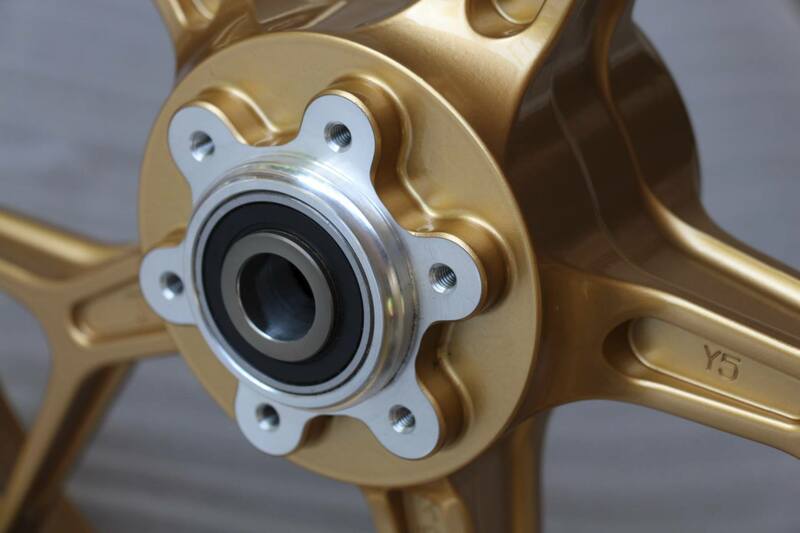 Specific details and features of the TYGA PVM wheels designed for MC28, NC30, NC35 application. 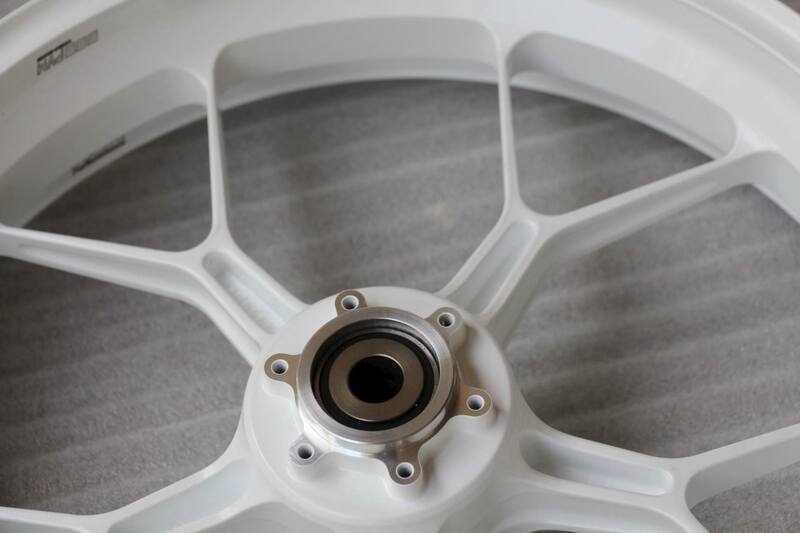 Sizing: The rear 5.00 x 17 size wheel supplied with this set is the ‘goldilocks’ size rear wheel for the RVF400, VFR400 and MC28 NSR250 because it is wider than stock but not so wide that you have tyre or wheel clearance issues as with the 5.25 and 5.50 width wheels made by other manufacturers. Please note however, that if you prefer we also supply a 5.50 rear set (part number TWHL-0013) which can be ordered if you prefer but please allow for issues with wheel and tyre clearance as with any other 5.50 wide wheel installed on these models. Fitment: They are a direct fitment for the models listed. 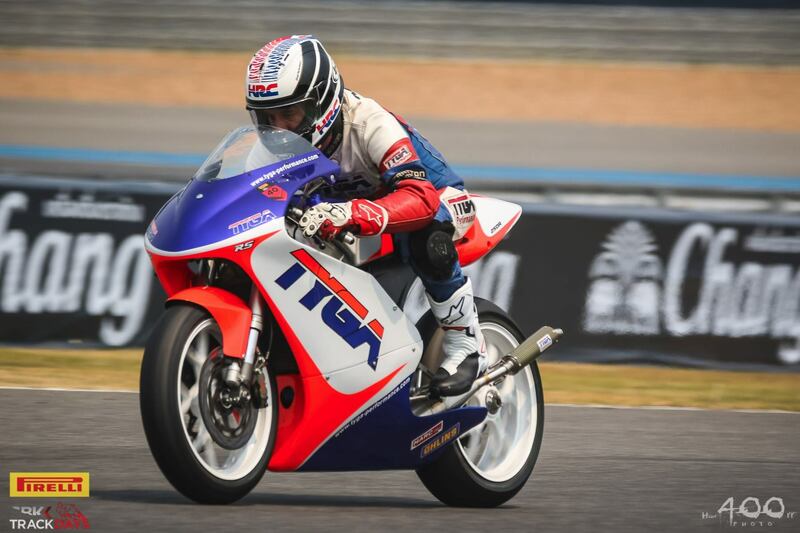 The rears are specifically designed by us here at TYGA to fit the Honda street bike hubs without the need to modify or change the rear brake rotor mounting bolts. The rear wheel uses a taper location system like the NX5 and RC30 for the hub nut, and as such the TYGA part TYLY-0196 "Pro Arm Rear Wheel Spacer, Taper Fit" is included with the 5.00" wheel, and replaces the standard Honda wheel spacer. The fronts have the correct bearing spacing for Honda street bikes of that period, so no time wasted by the user adapting them to fit. Simply use the front wheel together with the OEM wheel spacers. 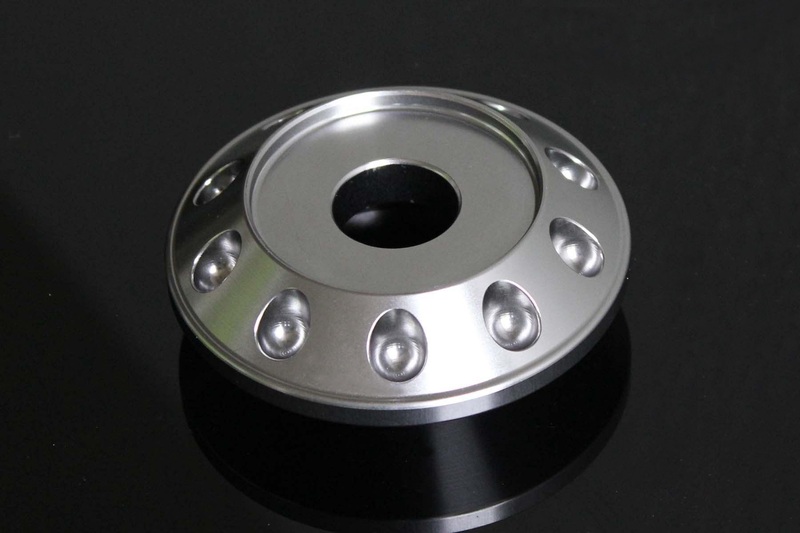 Strength: These wheels are made from forged aluminium so super strong but much lighter than cast aluminium wheels They are stronger and less prone to corrosion and cracking than magnesium. 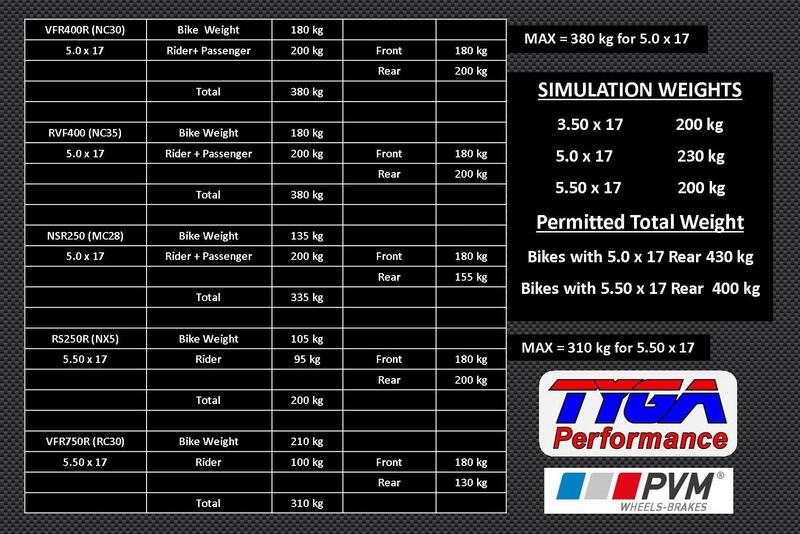 See load chart below for details of maximum weights. Style: They look stylish and modern with the Y spoke design and the tough and elegant finish in gold, white and satin black give the perfect finishing touch to your motorcycle's appearance. Price includes insurance and shipping worldwide from TYGA Europe’s warehouse based in the Netherlands by reliable carrier PostNL. 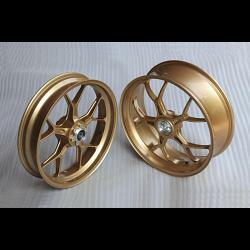 Notify me of updates to Forged Aluminium Racing wheel set, 5 spoke, PVM, Front 3.50 x 17, Rear 5.0 x 17, Gold.